Immediately to the north of Woodhenge and spanning the A345 road is the largest henge monument in Britain – a massive banked and ditched enclosure over 400m across and nearly 1.5km in circumference. Long recognised on old maps as an ancient British Village, Durrington Walls’ true importance only became apparent in the late 1960s when the road through it was realigned on a straighter path. You can see the line of the old, smaller, road in the aerial photo running to the left of the new road. A massive rescue archaeological dig carried out in advance of the roadworks, making use of large earthmoving equipment for the first time (rather than only spades, trowels and brushes), revealed the existence of two timber circles within, as well as evidence for a settlement dating back to the late Neolithic around 2,500BC. The scale of the ditch and bank is enormous – the ditch being over 6m deep, 7m wide at the bottom and 18m wide at the top, and the bank being over 3m tall and in places almost 30m wide. Further excavations in the mid-2000s by the Stonehenge Riverside Project discovered the remains of Neolithic houses just outside the southeast entrance to the henge, other buildings – perhaps ceremonial in purpose – in the western half of the enclosure, as well as a short Avenue leading down to the Avon in the direction of the winter solstice sunrise. Reconstructions of the houses were created at the new Stonehenge Visitor Centre, accurately based on the design and layout of those found at Durrington. The archaeological evidence suggests that the settlement at Durrington Walls, which may have supported several thousand people, was relatively short-lived and perhaps was in use for only 50 years or so. The period of peak activity corresponds with the time when the large sarsen stones were erected at Stonehenge and so it’s believed that this was the place where the builders and their families lived while that monument was being constructed. Careful study of the colossal amount of midden material left behind at the site shows that large gatherings were taking place, probably around the mid-winter time, with huge numbers of young pigs being eaten and their remains being deposited in feasting pits. Stable isotope analysis of tooth enamel proves that some of the animals were coming from as far away as the northeast of Scotland, Cornwall and the Lake District. This means that people were converging at Durrington from all over Britain, and suggests that Stonehenge was a “national” project rather than a local one. A major geophysics research effort by the Stonehenge Hidden Landscapes Project, carried out in the last few years, discovered the existence of about 200 large features underlying the bank at Durrington Walls. The traces were such that they seemed to indicate the possible presence of buried stones all around the perimeter of the site. In August 2016 a team of archaeologists excavated an area over two of these features to find out what the geophysics was telling them. Would the features prove to be large sarsen stones, which would overturn many ideas about the relationship of Durrington Walls to Stonehenge, or something else? It rapidly became clear that in fact these features represented large pits with ramps leading into them which had been used to erect posts about 0.5m in diameter and perhaps 5m tall. Then these posts had been removed, after what seems to have been a very short time – perhaps less than a year—and the chalk blocks from the bank and ditch construction had fallen in, filling up the pits so that they appeared highly reflective features to the geophysics equipment. The entire area was strewn with animal bone, including antler picks presumably used to excavate the pits in the first place, as well as pottery sherds and flint tools. One interpretation is that as the settlement was going out of use, the people decided to memorialise the site by surrounding it with 200 large wooden posts but then changed their minds and embarked on a closing down project of constructing a huge henge bank and ditch instead, withdrawing the timbers for use elsewhere. It’s hard to be sure, especially since only two of the features have been exposed. Durrington Walls is an integral part of the Stonehenge landscape and has a significance that were are only just beginning to appreciate. Trying to make coherent sense of its use by the people of the time is an ongoing task and there will be much more that we can learn in the coming decades. The Stonehenge Travel Company based in nearby Salisbury are considered the local experts and offer archaeological guided walking tours of Woodhenge, Durrington Walls and the greater Stonehenge landscape. Stonehenge Guided Tours offer tours from London and Bath including private group walking tours . London Walks offer guided tours from London via the train. Stonehenge Walks offer 1 – 5 hour guided tours from the Stonehenge visitor centre throughout the year. The Wiltshire Museum also offer guided walking tours throughout the year. In the early 19th century, William Cunnington discovered a burial site near Stonehenge. In one of the barrows he excavated at Normanton Down, the remains of a woman were found alongside some of the most well-preserved jewellery historians have ever seen. Now, more than 200 years later, these artefacts are going on display for the first time. The treasures that will go on display include amber earrings which are the earliest items found in Britain to show signs of being worked with a lathe. Buttons from a cloak and pendants also indicate the woman had social status, although her identity has never been established and it is not known why she was given such a lavish burial. The objects were discovered in the early 19th century by William Cunnington. ‘No barrow that we have yet opened has ever produced such a variety of singular and elegant articles,’ archaeologist Sir Richard ‘Colt’ Hoare wrote at the time. This Easter the objects are going on display at the Stonehenge Visitors Centre. A guided tour of the amazing collections of the Wiltshire Museum, followed by a guided walk from Durrington Walls to Stonehenge. This full day tour will be led by Museum Director, David Dawson. The morning visit to the Museum starts at 10.30am and the walk begins at 2pm. We should reach the Stonehenge Visitor Centre at about 5.30pm. The day begins with coffee and a guided tour of the Wiltshire Museum. The early story of Wiltshire is told in new galleries featuring high quality graphics and leading-edge reconstructions. On display are dozens of spectacular treasures dating to the time of Stonehenge and worn by people who worshiped inside the stone circle. The walk will take approximately 3.5 hours, and starts at Durrington Walls and Woodhenge, close to the River Avon. The route passes the Cuckoo Stone, a megalithic standing stone, before following the Apple Track – a WW1 light railway. The route then passes the prehistoric Cursus, before passing the Bronze Age barrows of Kings Barrow ridge. The route then follows the Avenue – the Neolithic ceremonial route that leads to Stonehenge following the line of the solstice. 1. Visit Stonehenge. This is free for English Heritage and National Trust members, but is not included in the cost. If you are not a member, then you should book your visit online from the English Heritage and you should choose a timed ticket for about 4.30 pm. You can then take the English Heritage shuttle bus to the Stonehenge Visitor Centre. 2. Continue to the Cursus barrows and the Western end of the cursus, before continuing to the Stonehenge Visitor Centre. 3. Take the English Heritage shuttle bus to the Stonehenge Visitor Centre and purchase a well-earned snack and cup of tea. At about 5.30pm, at the end of the walk, there will be car-share transport back to your car at the start of the walk, or back to the Wiltshire Museum in Devizes. Please note that the cost does not include entrance to Stonehenge. Visit Stonehenge for half term fun. 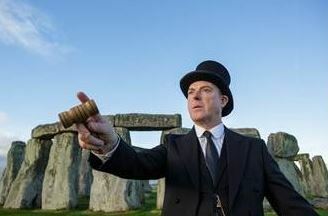 Last month English Heritage marked the 100th anniversary of Stonehenge – the most iconic prehistoric monument in Europe – being sold at auction to local Wiltshire man Cecil Chubb. The auction marked a turning point in the care of the ancient monument. A series of major restorations and excavations began a few years later and Stonehenge went from isolated ruin to national treasure. Today it is cared for by English Heritage, and thanks to extensive work now sits within a restored landscape that gives a sense of its original setting. What better way for kids to step into England’s story than exploring a World Heritage Site and its prehistoric monuments? The Stonehenge exhibition and visitor centre will entertain the most inquisitive of minds and there is plenty of outdoor space to work off extra energy, run and picnic. Pick up a family audio tour, explore our reconstructed Neolithic Houses and imagine what life would have been like for a Neolithic family four and a half thousand years ago! Entrance to Stonehenge is now managed through timed tickets and advance booking is the only way to guarantee entry on the day and time of your choice. By booking in advance you will also benefit from an advanced booking discount.